Build a LEGO Creator Expert replica of the world’s most popular automobile. This beautifully crafted LEGO model is packed with authentic details that capture the vehicle’s character and charm, including an azure-blue color scheme, curved fenders, white rims with distinctive hubcaps, round headlights and wing-mounted turn signals. Lift the hood and you’ll discover a spare tyre and fuel tank, while in the trunk you’ll find a detailed 4-cylinder air-cooled engine. You can even open the doors or remove the roof section to access the detailed interior. 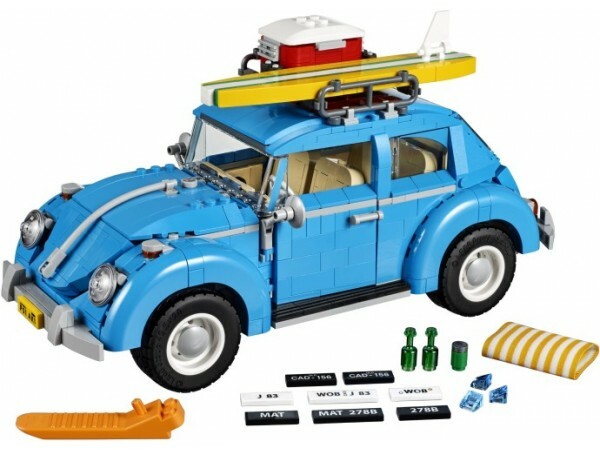 Tilt the rear seat forward to reveal a storage compartment with beach towel, and of course, no 1960's VW Beetle would be complete without a surfboard and a cooler box, the perfect accessories for a fun day at the beach! Lift the hood to access the spare tyre and fuel tank. VW Beetle including surfboard and cooler measures over 15cm high, 29cm long and 12cm wide.